Golf in Idaho features few crowds, reasonable pricing, and Pacific Northwest views to treat the eye. Greens like velvet, fairways shaded by Ponderosa pines and Douglas firs and tees with million-dollar views of mountains and lakes are what’s in store when you tee off at any of North Idaho’s challenging and scenic golf courses. The crown jewel of Northwest golf is nestled in the southeast corner of Coeur d’Alene on Lake Coeur d’Alene’s north shore. 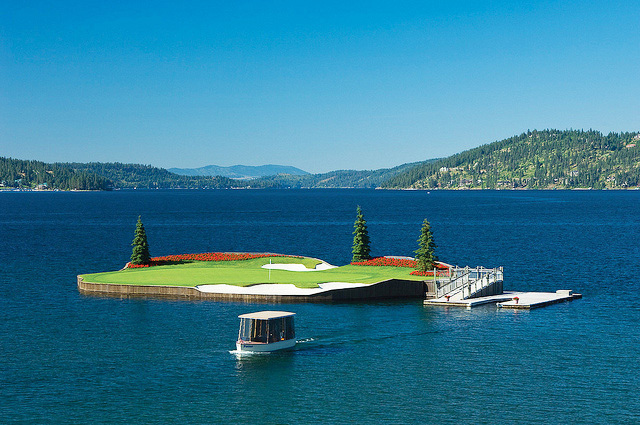 The Coeur d’Alene Resort Golf Course with the famous floating green, has played host to PGA touring pros and was selected by Golf Digest as America’s most beautiful resort golf course.